*This article was originally published on April 9, 2015 in the New Braunfels Herald-Zeitung. You can view the article on its original page here. Passed by the Texas legislature with support from Democrats and Republicans and signed into law by then Texas Governor Rick Perry in 2001, the Texas Dream Act was once a bipartisan law. The law allows non-citizen resident students to pay in-state tuition which affects nearly 25,000 students each year. This law has permitted Texas to tap into the academic and economic potential of students who would otherwise not have been able to go to school. Unfortunately, today it has become a point of contention that threatens to make Latino education a highly partisan issue in the Lone Star State. Repealing the Texas DREAM Act is misguided and shortsighted. It is opposed by Texas House Speaker Joe Straus, the House's highest ranking Republican, and the UT System Chancellor, William McRaven. In addition, out of 176 witnesses, 171 spoke against repealing the Texas DREAM Act, and the Senate is moving forward with the consideration of Senate Bill 1819 which would do just that. Specifically, the bill would repeal language in the Texas Dream Act that allows high-achieving undocumented students the opportunity to pay in-state tuition. There are already many obstacles preventing students from enrolling, attending, and graduating from college. Rather than spending time trying to make it more difficult for a specific group of people to go to college, Senator Donna Campbell (R - New Braunfels) should instead consider a bill that would allow more Texas students to have a college education. The arguments against providing in-state eligibility to high-achieving undocumented students have been readily dismissed. Claims that the law is a magnet for more immigration, a drain on the economy, and perhaps most offensive of all, an assault on the real “Texas kids” have been dismissed by experts and stakeholders alike. For example, the Center for Public Policy Priorities analyzed the numbers released by the Texas Higher Education Coordinating Board and surmised that non-citizen resident students comprise just 1.9% of all college students who paid in-state tuition for 2013. That same report noted that only a miniscule .32% of non-citizen resident students receive any form of financial loan or other financial assistance. The Texas Higher Education Coordinating Board reported this year that non-citizen resident students paid $51.6 million in tuition and fees to Texas community colleges and universities in 2013. In addition, according to the Institute on Taxation and Economic Policy non-citizen resident immigrants paid over $1.6 billion in local and state taxes in 2010 alone. In actuality, this is an attempt by Senator Campbell to use non-citizen resident students as a wedge issue to realize political gain and it is sure to fail. Although Senator Campbell has justified her bill by arguing that it puts “Texas kids first”, the reality is that it puts Texas kids first except if those Texas kids are Latino. These efforts are reminiscent of the days when white segregationists fought tooth and nail to keep children of Mexican immigrants in dilapidated, unequal, and segregated schools. LULAC was founded and organized in part to combat that type of segregation, filing critical lawsuits to end discriminatory segregation policies in the state of Texas. Today, that sentiment is back and it is manifesting itself as SB 1819. Let there be no confusion, Senator Campbell’s move will pit the state's sizable Latino population against stalwart conservative lawmakers looking to seem tough on "border security." Say no to SB 1819 and yes to a united Lone Star State! 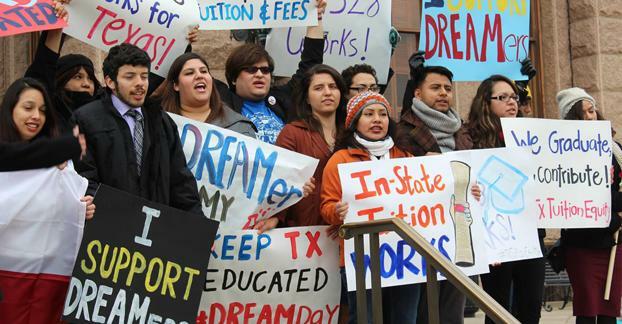 If you are from Texas, and want to take action now to protect the Texas DREAM Act, LULAC will send a letter to your state representative on your behalf. Fill out the necessary information here to show your support for a united Texas. Steven Sanchez is the President of LULAC Council 4217 of New Braunfels, Texas. LULAC Council 4217 is active in the community of New Braunfels, organizing the Relay for Life in partnership with the American Cancer Society; and mobilizing its membership around other charitable activities. Currently, LULAC Council 4217 is organizing a community event entitled, Mayfest, which will feature Latino culture, cuisine, and music. LULAC is the largest and oldest Latino civil rights organization in the country. After days of debate, the much anticipated vote-a-rama on the Senate budget resolution, S.Con.Res. 11, began on Thursday, March 26, 2015. While intended to be a general framework of priorities for government spending that sets parameters for the coming appropriations process, the budget is non-binding, which allows for broad overtures and grandstanding for party support. That aside, the budget debate—and its corresponding amendment process—offers politicians of both parties, at best, an opportunity to pitch priorities, funding ideas, and, at worst, a vehicle to push forward amendments aimed at steering funding to support radicalized views on a wide range of topics. McCain 359 - would direct additional resources to Southern border enforcement despite the border being more secure than ever. More resources are not needed to secure the border. The federal government has deployed more resources, agents, and technology to the border than ever before and the number of people apprehended crossing the border is at a 40-year low. Meanwhile, the number of border agents and removals at the border are at an all-time high. McCain 360 - seeks to deter unaccompanied immigrant children from coming to the U.S. by undermining protections for such children and subjecting them to expedited removal process that provide almost no due process. McCain 360 would result in children asylum seekers who have come alone to the U.S. being sent back to persecution and other life-threatening dangers. Grassley 469- aims to restrict access on a retroactive basis to the Earned Income Tax Credit. Already unauthorized immigrants cannot receive the EITC even though they pay federal taxes. But Grassley 469 will harm many immigrants who are lawfully present, including asylum seekers, people awaiting green cards, crime victims, spouses of those serving in the armed forces. It would also harm DACA and DAPA recipients. Grassley 469 would create a discriminatory two-tiered tax system that would hurt thousands of families who have U.S. citizen children living in poverty. People who are legally required to pay taxes deserve access to the same earned tax benefits as anyone else. Vitter 507- serves no purpose whatsoever because it claims to prohibit unauthorized immigrants from obtaining affordable care act subsidies but they are already statutorily restricted from all such programs. Moreover, Vitter 507 would primarily harm U.S. citizens by adding more verification requirements. Isakson 611 and 612- are intended to defund the President’s executive actions on immigration for the Deferred Action for Parents of Americans and lawful permanent residents and the Deferred Action for Childhood Arrivals. The amendment aims to prohibit U.S. Citizenship and Immigration Services (USCIS) from spending fees collected unless approved through the annual approval appropriations process. This would severely obstruct the agency’s ability to conduct business for any future administration. Flake 678- would establish a deficit-neutral reserve fund relating to federal criminal prosecutions of first time illegal border crossers. Already such prosecutions for illegal entry are among the most prosecuted crimes and are rapidly increasing every year. Moreover criminal prosecutions for immigrants charged with illegal entry raise grave concerns about fairness and due process. The amendment aims to prohibit any future policies that reduce such prosecutions and takes decision-making authority away from US attorneys to focus on more serious offenses. U.S. attorneys may need to target resources against narcotics or weapons smuggling offenses and other violent crimes, but Flake 678 ties the hands of law enforcement that is trying to protect the American public. Cassidy 806- is intended to restrict Department of Homeland Security (DHS) from using any funds appropriated for processing and adjudicating naturalization applications for any other purpose. This amendment would restrict DHS from processing the President’s executive actions on immigration including the expanded DACA and DAPA programs. Furthermore, Cassidy 806 takes the extraordinary step of establishing a “point of order” against any future legislation that would allow the use of such funds for any other purpose. Cassidy 807- is intended to restrict DHS from using any funds appropriated for the processing and adjudicating of immigration benefit applications for any other purpose than to process or adjudicate the specific benefit. This amendment targets the DACA and DAPA programs by restricting USCIS from using funds to process those applications. Furthermore, Cassidy 807 takes the extraordinary step of establishing a “point of order” against any future legislation that would allow the use of such funds for any other purpose. Vitter 849- aims to redefine the 14th amendment in order to prevent the children of undocumented immigrants from receiving citizenship. The amendment would restrict citizenship for persons who are born in the United States only to those who have a U.S. citizen parent or a lawful permanent resident parent. Any restrictions on the rights of citizenship guaranteed in the 14th Amendment would offend this country’s most sacred values and Constitutional principles. Placing limits on citizenship rights would re-establish the very same discriminatory exclusion that the 14th Amendment was intended to remedy. Repeal of citizenship based on place of birth would create enormous administrative nightmares for most American citizens, who would no longer be able to use their birth certificates as proof of citizenship. Already Federal and local law enforcement agencies are aggressively prosecuting fraudulent “birth tourism” schemes using existing criminal statutes. Vitter 850- aims to prohibit the allocation of funds to any agency for the purpose of administering any part of the President’s executive actions on immigration announced on November 20 and 21, 2014. The amendment would not only extinguish the DACA and DAPA programs but could also be used to target other programs announced last year that would help businesses, entrepreneurs, families waiting to reunite with loved ones in the legal immigration system, and those who plan to serve in the armed forces. Grassley 960- aims to establish a mandatory electronic verification system. Though we recognize the value of an employment verification system, a mandatory system cannot be implemented in isolation without other reforms as it would devastate the agricultural industry and other sectors of the economy. Grassley 960 would likely harm about 150,000 authorized U.S. workers and put many out of work. Every year large numbers of people who are authorized to work are erroneously denied employment authorization by errors in the E-Verify system. Most wait for weeks to resolve the problems in the system frequently losing wages or even job offers during the delay. Small businesses would suffer significant disruption to operations and incur costs of about $2.6 billion. Sessions 955- aims to prohibit unauthorized immigrants from qualifying for Social Security and Medicare. Unauthorized workers are already ineligible for Social Security benefits. Only upon obtaining authorized employment status can they receive credit for their contributions to the system and later have access to their earned benefits. Sessions 955 is also designed as an attack against recipients of the DACA and DAPA programs who obtain employment authorization. Session 955 would harm many immigrants lawfully presents including asylum seekers, people awaiting green cards, crime victims, and spouses of those serving in the armed forces. Finally, many unauthorized workers contribute to the Social Security trust fund but are never able to draw upon the benefits. The Social Security system estimates that unauthorized workers have paid $100 billion into the trust fund over the last decade, helping the system but not benefiting from it. These are just some of the most extreme measures being considered as part of the vote-a-rama that began on Thursday, March 26 and which is set to continue throughout the day today. CSPAN has live coverage of the spectacle here and Roll Call has the minute by minute here. LULAC weighed in with a letter to the Senate urging opposition to these amendments and will continue to monitor the ongoing budget process. To view a copy of the LULAC letter, click here.